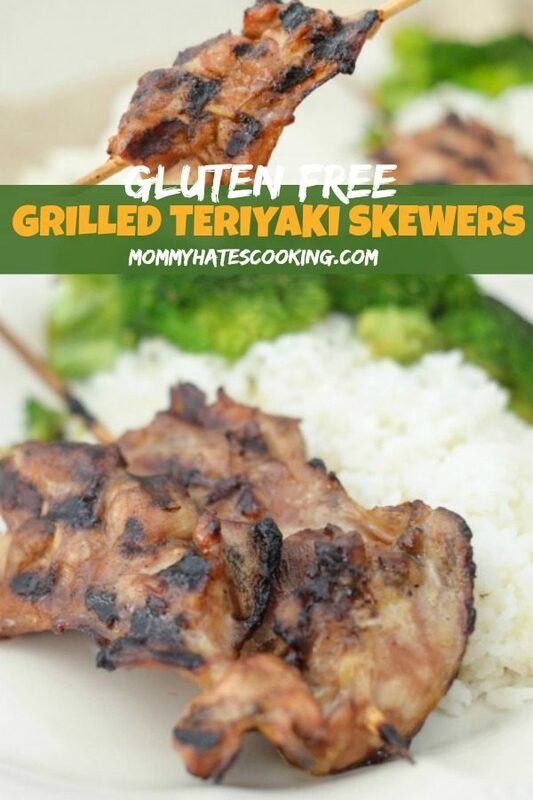 Gluten-free chicken teriyaki skewers are made with a delectable homemade sauce that you’ll make again and again. About a month ago now, we went to a wedding for a family member, and of course, dinner was served there. I saw that it was some type of teriyaki chicken with rice and broccoli. Immediately, I thought we would end up having to take our kids to get something else to eat because they are so picky. I couldn’t imagine that they would eat that because I had tried and failed many times before. Then, my son, who was sitting by his grandparents, runs up to me and ask if I had tried the chicken. I told him I was getting to it, but he then proceeds to say that it was so good he had already had four chicken skewers. I was SHOCKED! Then, I look next to me at my daughter, who was eating broccoli so fast she couldn’t get enough. Who were these kids? Surely not mine! 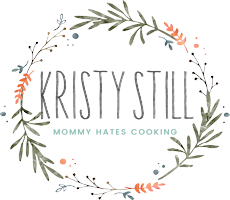 Ever since the wedding, my son has been begging me to make that chicken again. I decided I would give it a try, but this time I planned to grill it and then pair it with rice and broccoli. Just like before, my daughter was downing the broccoli and my son was begging for more chicken. 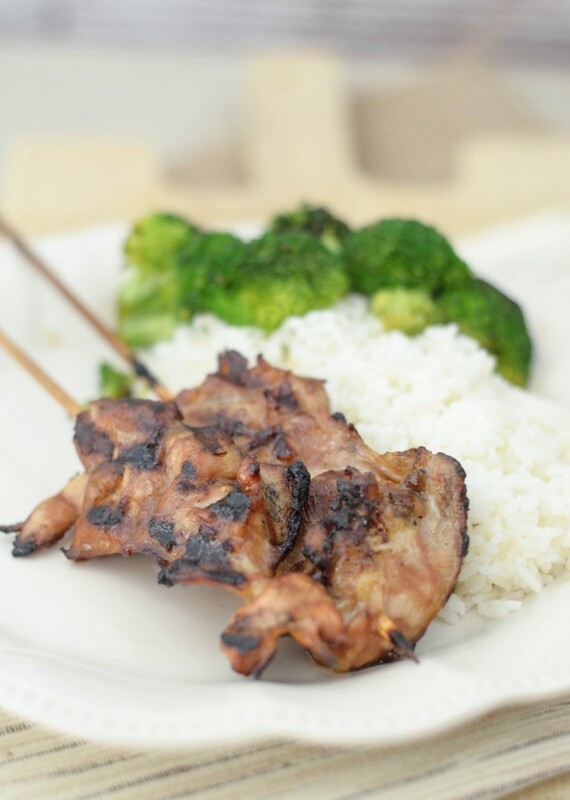 What type of chicken should you use for Gluten-Free Teriyaki Chicken Skewers? 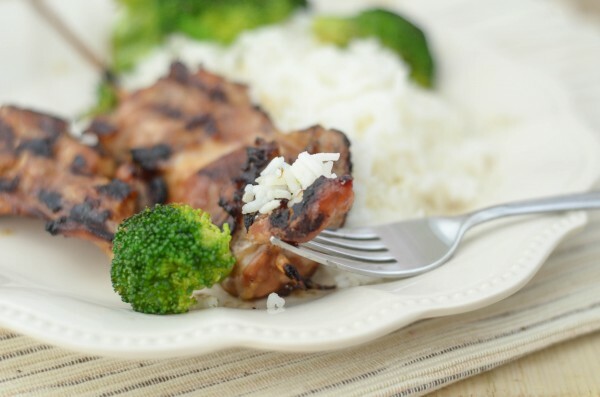 It’s best to use boneless, skinless chicken thighs. The chicken breast dries out and the fat from the chicken thighs gives the chicken a more juicy flavor. How do you make the teriyaki sauce gluten-free? 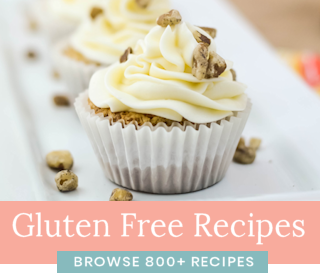 Making gluten-free teriyaki sauce is really easy, it’s simply a matter of using a gluten-free soy sauce. We like to use Kikkoman Gluten-Free Soy Sauce. 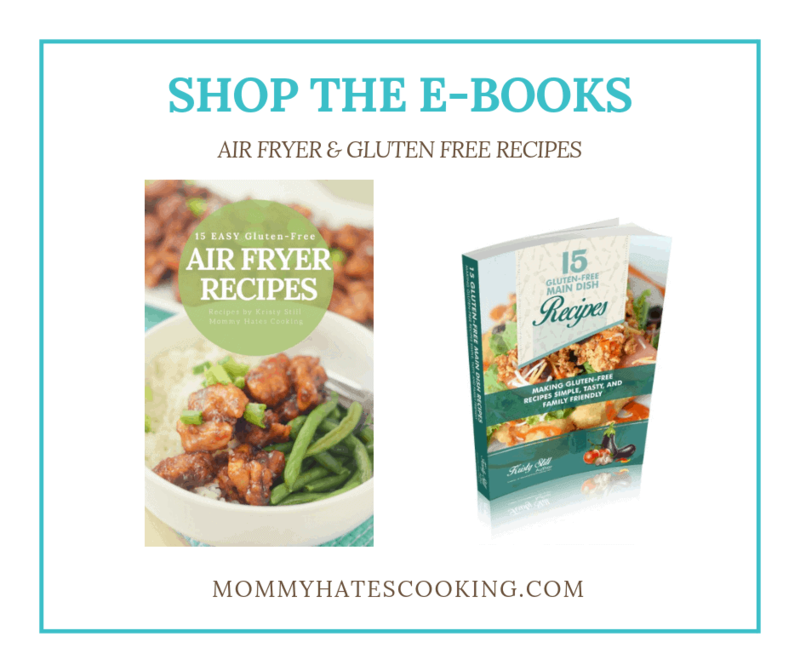 What do you need for Gluten-Free Teriyaki Chicken Skewers? It’s that simple! 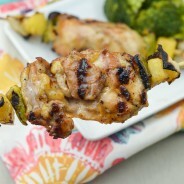 This is a great go-to for the grill for parties or simply for a tasty dinner. 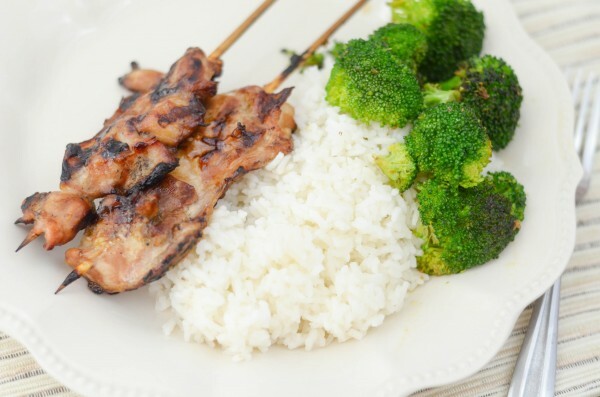 Make dinner delicious with Gluten-Free Chicken Teriyaki Skewers! Warm up the grill to medium-high heat. 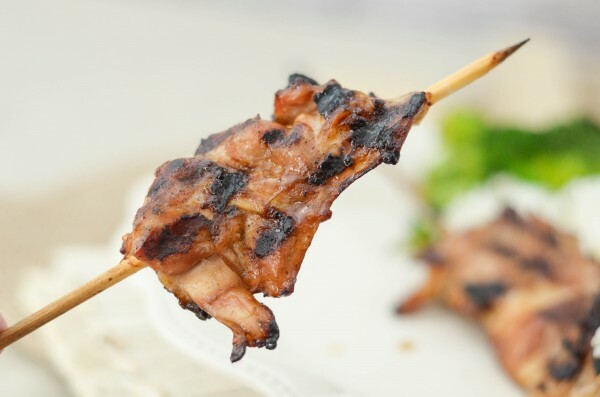 Begin by cutting the chicken down the middle and then putting it onto the skewer sticks, cutting will help them fit better on the stick. Add the soy sauce, water, vinegar, sugars, garlic, and ginger to a medium sized saucepan and warm up to a boil. Once boiling, whisk in the cornstarch and remaining tablespoon of water for about a minute and then remove from heat. Use a brush and brush the soy sauce mixture onto both sides of the chicken. Cook these on the grill for about 20 minutes or until the internal temperature of at least 165°F. Serve with side of rice and broccoli if preferred. 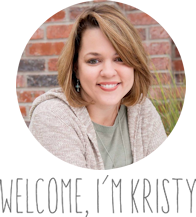 Hi Kristy! 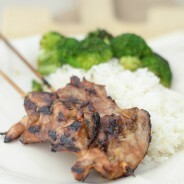 Whenever I go to a Chinese restaurant, I always order the chicken teriyaki skewers. I’m going to save some money and try this recipe! It looks soooo delicious. You did an amazing job. Can’t wait to try the recipe! I personally love chicken teriyaki. Your kids sure know how to identify delicious food. I can relate to you when kids get too picky. Thanks for sharing your recipe. I’ll give this a try. Good thing it’s gluten-free. I love teriyaki! It is one of my favorite flavors! 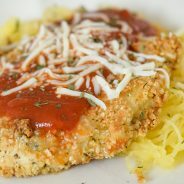 I am so excited to try this recipe and also, I want to try this sauce on beef! I think it would be so good! Wow these chicken skewers look out of this world. I order them sometimes when we order chinese, but it always turns me off because they are expensive for so little, so I would love ones I could make at home. I will be trying this very soon thanks for sharing your creation. 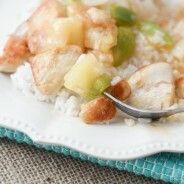 Chicken teriaky is one of my favorite recipes cause it uses soy sayce, and I’m a big fan of soy sauce! Tho I don’t usually cook with any type of sugar, I’m curious to give it a try.